Across Colorado’s prairies and mountains, layers of asphalt cover many of the paths first cut by the region’s indigenous peoples centuries ago. One early route originally followed by the Ute Indians illustrates the transformation of a footpath to a highway over a millennium. 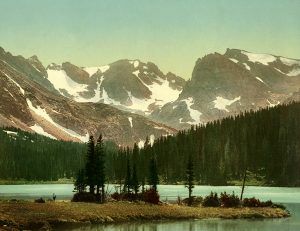 Nearly 1,000 years ago, the Ute traced a path from Estes Park over the Continental Divide to Middle Park. Subsequent European and American explorers, trappers, and settlers followed the same route, eventually naming the trail the Ridge Road. By the mid-1920s, federal and state bureaucracies took the romance out of travel and classified the auto road as US Highway 34. Other modern highways that trace their lineage back to the Ute include a portion of US 24, crossing the Rockies west of Colorado Springs along an ancient tribal route to modern-day South Park; the trail over the 10,032-foot Cochetopa Pass that is today’s State Highway 114; and US Highway 160 from the Rio Grande to the San Juan River over the Continental Divide by Wolf Creek Pass. In 1540, the first Europeans arrived in Colorado. Twenty-two members of a scouting party under the command of General Don Francisco Vasquez de Coronado wandered across southeastern Colorado in search of the Seven Cities of Cibola. Over the next 150 years, the Spanish fought to control their Pueblo Indian serfs; battle other Native tribes; and avoid much exploration beyond Santa Fe, the capital of New Spain’s Province of New Mexico. In 1694, after putting down a Pueblo Indian revolt, Governor Don Diego de Vargas led an expedition from Santa Fe upriver along the course of today’s U.S. Highway 285. By 1706, a group of colonists established Colorado’s first European settlement, a trading post 100 miles south of Pueblo. For the remainder of the 18th century, conquistadors and friars followed their own routes through the San Luis Valley. Spanish trailblazers like Juan de Ulibarri, Fathers Silvestre Escalante and Francisco Dominguez, and Don Juan Bautista de Anza all provided early descriptions of Colorado’s geography, plants, and wildlife. While the Spanish built roads in California and New Mexico, the land north of Santa Fe was too wild, too distant, and seemingly lacked any resources for the Spanish to control and maintain. Through the Louisiana Purchase of 1803, the United States acquired a vast area of the continent that included most of eastern Colorado. 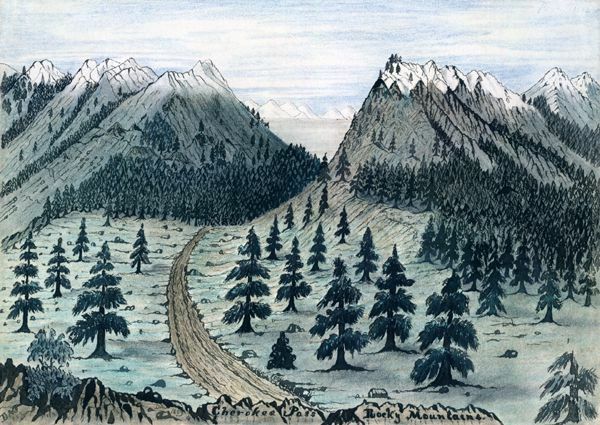 During 1806-07, Lieutenant Zebulon Pike and his men crossed much of southern Colorado, establishing Pike’s Stockade at the Conejos River in the San Luis Valley. They were arrested and later set free by Spanish authorities. In 1820, President James Monroe sent Major Stephen H. Long to explore the southwestern boundary of the Louisiana Purchase. When Long’s party came up the South Platte River, Long dismissed the high plains as the “Great American Desert,” a lasting perception in many American’s minds for decades to come. Undeterred by Long’s opinion, a handful of solitary outsiders making a living trapping beaver and trading with the Natives followed. Over the next two decades, subsequent sojourners would blaze two important paths into Colorado: the Smoky Hill Trail from Leavenworth, Kansas and on to Cheyenne Wells, Hugo, Limon, Bennett and Denver; and the Overland Trail from South Platte, beginning at latter-day Julesburg to Greeley and up the Cache La Poudre River to LaPorte. 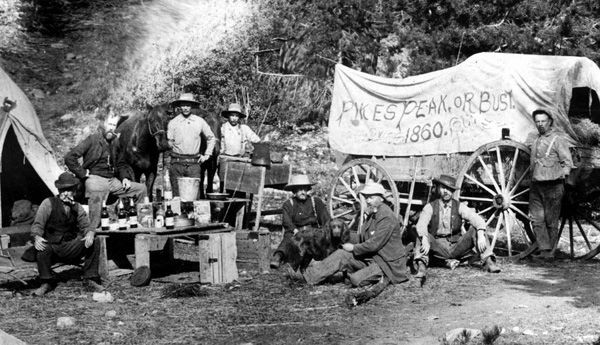 The era of the mountain man concluded abruptly by the late 1850s with the arrival of the first gold-seekers’ wagons with “Pike’s Peak or Bust” red-chalked on their sides. 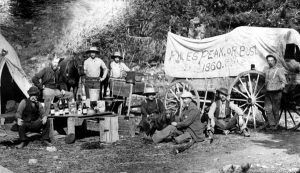 In 1860 alone, nearly 70,000 survived raiding parties, inclement weather, starvation, and drought to take a chance on finding gold—following routes first cut by the trappers. Perhaps the most important of the early trails, the Santa Fe Trail served as the primary link between St. Louis, Missouri, and the Spanish-Mexican outpost of Santa Fe beginning in the 1820s. In the late summer of 1821, William Becknell led a trading party from the banks of the Missouri River through southern Colorado on to Santa Fe. By November of that year, he reached Santa Fe and established a caravan trade that lasted more than 40 years. By the 1830s, the northern, or Mountain Branch, of the Santa Fe Trail was the first route into Colorado from the east. The trail was a link between New Mexico over Raton Pass to the markets of the Missouri Valley and the trading posts along the Arkansas River. 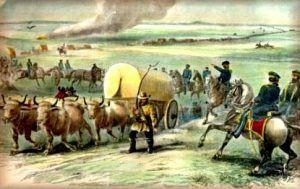 In 1821, American pack and wagon trams first plodded along the Santa Fe Trail in southeastern Colorado along the route later used by US 50 and 350. Between 1829 and 1834, William Bent established his Fort on the Arkansas River and added a new chapter to the history of the Santa Fe Trail. By the early 1830s, Becknell’s original route had fallen into disuse, due to Kiowa and Comanche tribesmen on the warpath. Nearly 100 miles longer, the route by way of Bent’s Fort was safer from Indian attack and since it followed the Arkansas River, Timpas Creek, and the foothills of the Sangre de Cristo Mountains, there was less likelihood of stock dying of thirst. As with other trails, the subsequent march of the railroad put the trail into disuse. By 1880, the first train blazed into Santa Fe, and with the arrival of the automobile, the route of the old trail is better known today as US 50 and 350. As well traveled as the Santa Fe, but not as storied, the Cherokee Trail began on the Arkansas River near the current Arkansas–Oklahoma border. 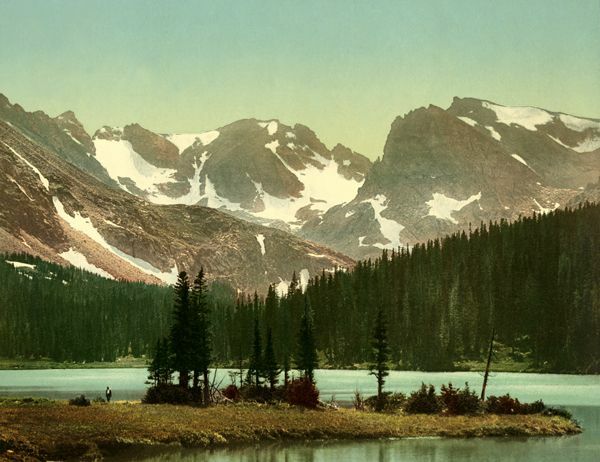 French explorers of the mid-18th century were among the first Europeans to follow this route through Colorado. The Cherokee Trail branched off the Santa Fe Trail at La Junta. From there, the Trail continued up the Arkansas River, then followed Fountain Creek to Colorado City and on through Denver to Virginia Dale near the Wyoming border. 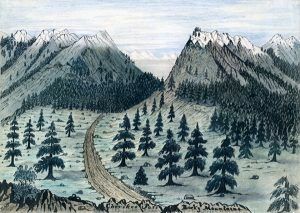 The Cherokee Trail eventually reached the gold fields near Sacramento, California. US Highway 50 follows the route of the Cherokee Trail from the Kansas border to the east side of Fountain Creek from Pueblo to the town of Fountain. A subsequent stage road continued up the west side of Fountain to Colorado City before the founding of Colorado Springs. In the wake of the automobile, the original alignment of US Highway 85 (now Interstate 25) followed the path of the Cherokee stage route through this portion of southern Colorado.